We are manufacturers and Suppliers of High-Quality Digital Textile Printers. These Printers are ideal for short runs and production scale projects. 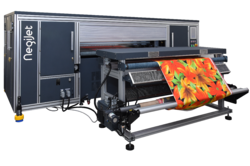 These printers are specialised to Print on imaginable fabrics including Silk, Cotton, Wool, Viscose, Linen, Rayon, Jersey, Synthetic. Ideal for printing applications such as Digital Printing of Home-furnishings, Digital Printed Fabrics,Digital Printed Sarees, Printing on Silk, Printed Dupatta, Digitally Printed Kaftan, Printed Kurtis, Printed Tunics, Digital Printed Scarves, Stoles And Shawls. Best designed Belt-transporting System, with the Auto Brush & Sponge Roller Washing System. The Negijet V4 65B Printer (1625mm – 64″) incorporates the very latest piezo drop on-demand head technology and new generation electronics. 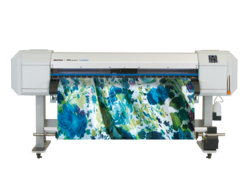 Targeted at Direct Textile Printing, the printer addresses the needs of businesses focusing on both high speed production and top quality print work. Applications: Fabric Printing, Saree Printing, Digital Cushion Cover Printing, Digital Bed sheet Printing, Digital Home furnishing products, Viscose Fabric Printing, Stoles printing, Scarves printing. The Mutoh ValueJet Textile Printer 1638WX doubles the productivity of a print shop. VJ 1638WX provides outstanding performance at a competitive price, making it the smart printer choice for shops looking to expand applications, increase production and improve efficiency.